A new partnership highlighted the new year as Trackmobile, Zephir S.p.A., and LEAF locomotive joined together under the Berkshire Hathaway, Marmon Holdings, Inc. umbrella to form the Global Railcar Mover Group. As global manufacturers and industry leaders responsible for “the design, manufacture, and service of machines for moving railcars and locomotives,” the Global Railcar Mover Group intends for this partnership to demonstrate its commitment to safe rail operations and elevates each member to the next level in their commitment. As a unified group, the Global Railcar Mover Group provides industries with a full spectrum of choices to handle all their railcar movement needs. They offer tractive effort capacities ranging from 27,000 to 80,000 lb/ft using environmentally friendly Tier 4-compliant engines ranging from 130 to 1200 hp or electric motors that range in drawbar pull from 3475 to 40,465 lb/ft. The Global Railcar Mover Group is an option for industrial operations, shipping, and receiving materials and finished goods via rail shipping transportation. 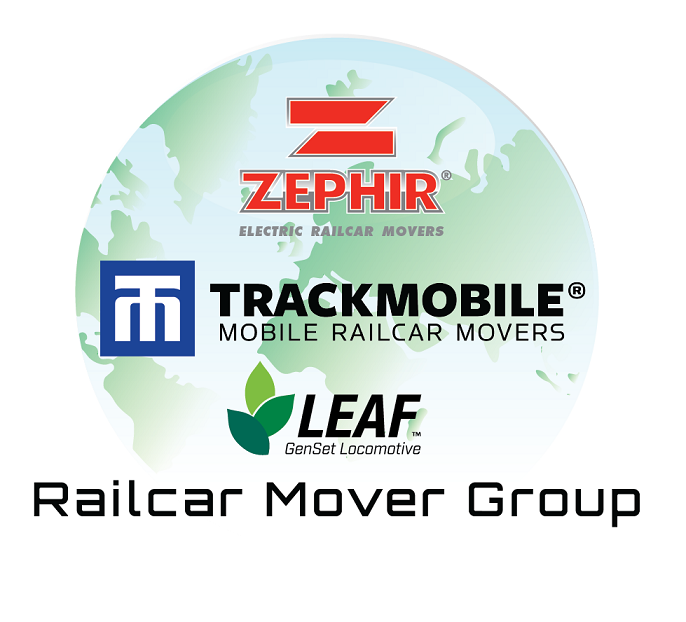 The Global Railcar Mover Group is comprised of three brands of railcar mover solutions. Trackmobile, a U.S.-based company, invented the first railcar mover in 1948 as a solution for railcar shunting in the handling of industrial materials. Founded in 1969, Zephir S.p.A. is an Italy-based railcar mover manufacturer that innovated a battery-powered (electric range) railcar mover in 1991 as an environmentally friendly solution for railcar shunting. And since 2008, LEAF, a U.S.-based company, has been successfully saving locomotive customers significant fuel costs with its Tier 4, FRA-compliant new locomotives designed for lighter weight line haul operations. “We are excited about the innovation and growth opportunities that lie ahead for this new group. All the combined resources of this group and the distributor network will allow us to succeed in every facet of this industry,” said Przybyszweski. Available throughout North America through the Trackmobile distributor network, industries can receive expert rail operations analysis with unbiased railcar movement equipment solution recommendations. The Global Railcar Mover Group covers industrial rail shipper needs to move 1 to 75 or more loaded railcars. Visit www.trackmobile.com/products to view a selection of what the Global Railcar Mover Group offers.